An excellent photo opportunity has presented it’s self. SpaceX has scheduled a resupply mission to the International Space Station, launching right at dawn. There was a really good chance 45 minuets before sunrise, there could be some really nice color in the sky. I could not pass this up, I had to give it a try. 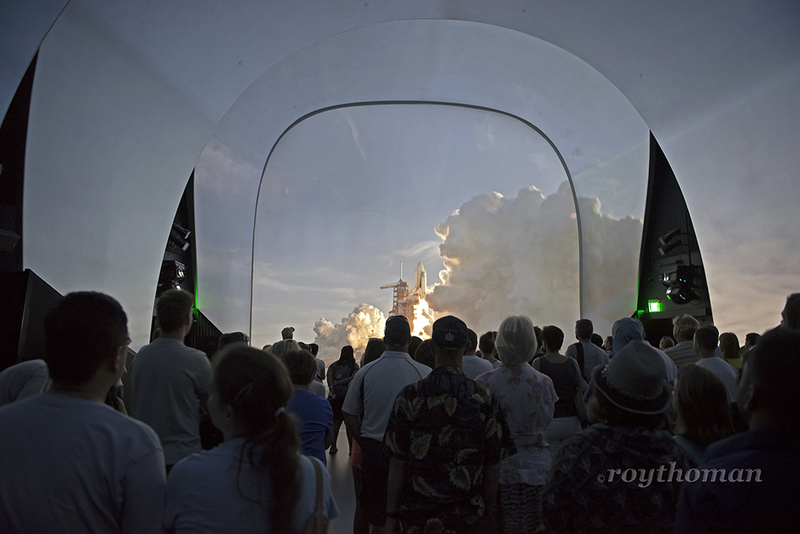 My wife Robbie and I recently had the opportunity to visit Space Shuttle Atlantis in her new home at the Kennedy Space Center Visitor Complex. In preparation of Atlantis’ arrival, the Visitor Complex underwent a facelift. From the new entrance, to the new building that houses Atlantis. At the entrance to the Atlantis exhibit there is a replica external fuel tank and solid rocket boosters that are huge! From Titusville looking across the Indian River at an actual Space Shuttle on the launch pad you really needed to strain your eyes to see the darn thing. The new replica tank and SRB’s can easily be seen from almost anyplace in Titusville. They make a very striking entrance to the new exhibit. After watching the construction and Atlantis moving from the Space Center to the Visitor Complex it was very interesting to see how it all came together. I think they did a fantastic job! Once inside the exhibit visitors are treated to an entertaining, humorous, and informative short video about the history of rockets. 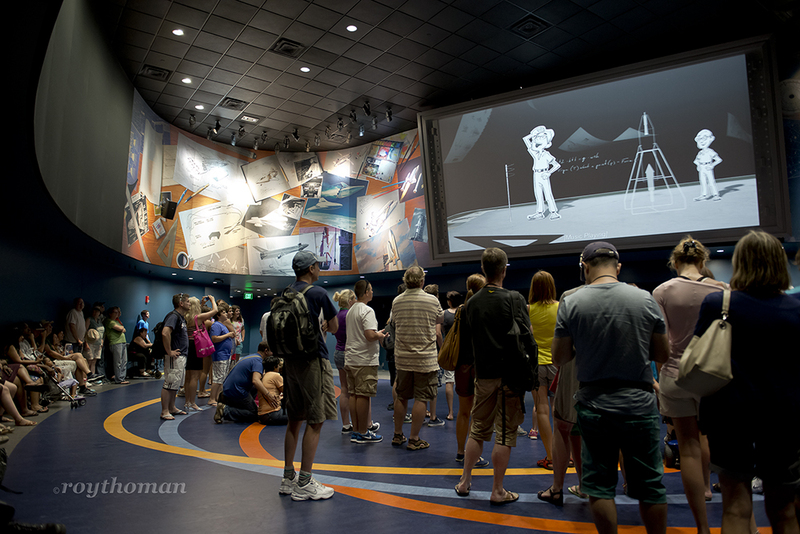 Visitors are then moved into an amazing theater. 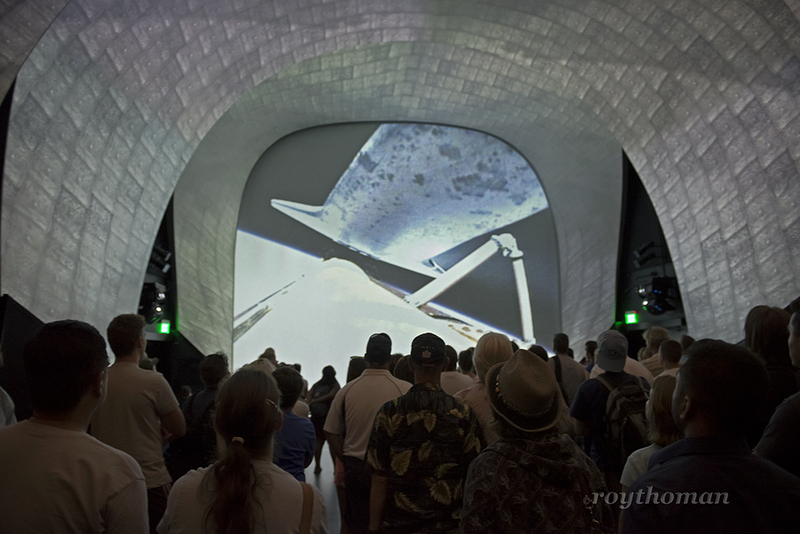 A video of Atlantis launching and working in space is projected onto the walls and ceiling of the theater. You can feel the vibration as Atlantis thunders into space. It’s really amazing to watch. As the theater fades to a black star filled sky, a large door opens and you find yourself face to face with the real Atlantis. 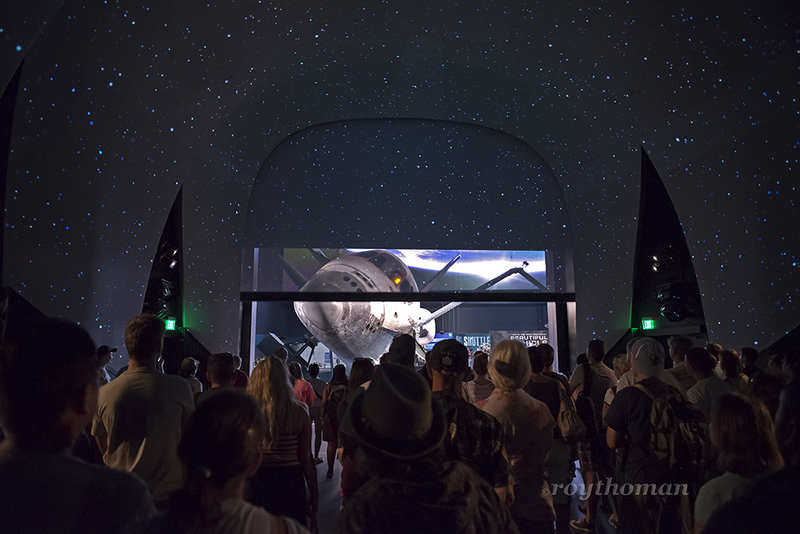 As you walk out of the theater, Atlantis is looking you in the eye. She is very proud of the many accomplishments that were made in her 26 years of service. Robbie and me, I wore my Atlantis Tshirt for the occasion. 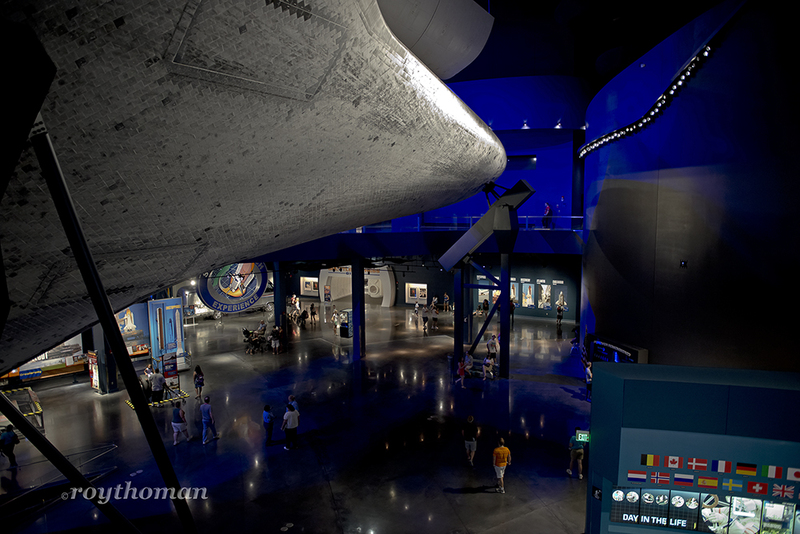 The upper level of the exhibit is filled with information about Atlantis and the 33 missions that Atlantis flew. On one of her missions, Atlantis and her crew repaired the Hubble Space Telescope. 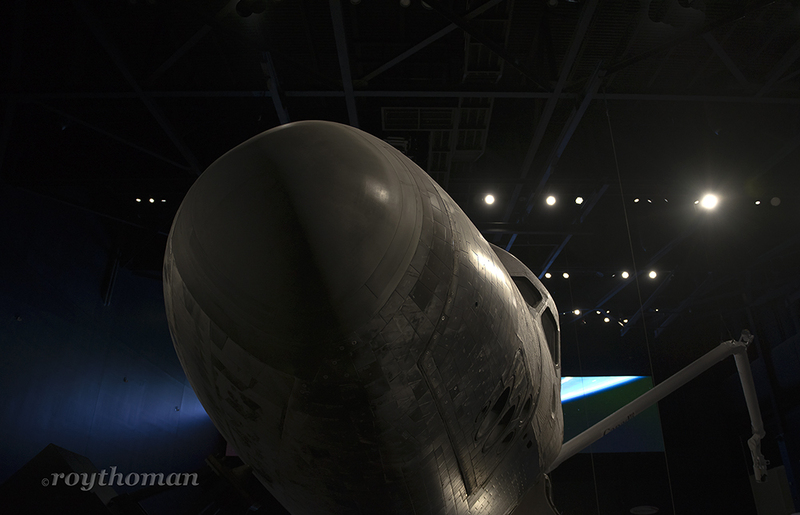 Getting a good view of Atlantis from any angle imaginable is not the only thing to see. There is a shuttle cockpit mockup where you get to see what it was like to fly a shuttle. There are very cool interactive displays. In one of them you are looking at a video of an astronaut during a space walk. Then you become the astronaut. As you move your hand the astronaut moves his hand using a tool to make a repair. Behind Atlantis there is a HUGE video screen with images of the Space Station and astronauts making space walks. 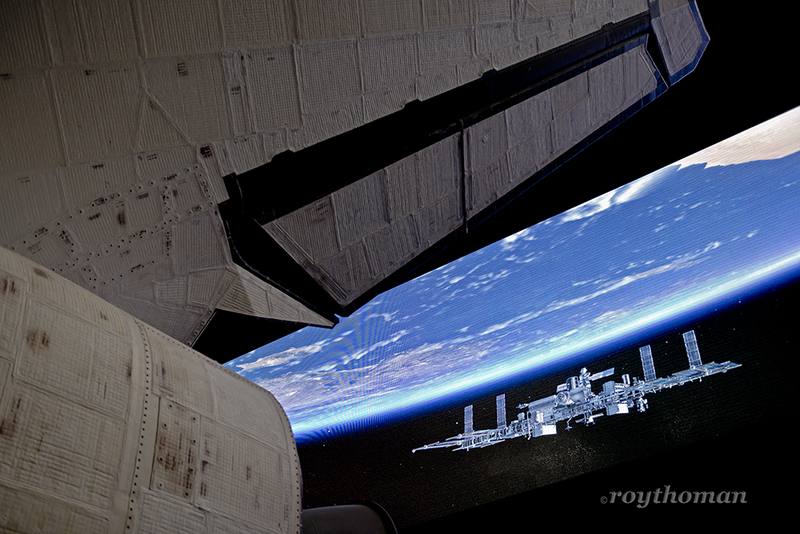 You don’t need to use too much imagination to feel like you are in space with Atlantis. You could take the eery red hallway! Or even better, you can do what we did, and take the way cool sliding board to the lower level! That was fun! Before you head down the slide, you may want to take a tour of the model International Space Station. It’s like a habitrail for humans. You get a feeling of what it’s like to spend some time in the Space Station. There is a bit of a thrill as you encounter a clear tube 30ft or so above the floor. The girl in the photo was hesitant to cross the gap. I think a push from her friend got her moving through the tube. Once you make it to the lower level, aside from seeing Atlantis flying over your head, there are many more things to see. I’m not sure I saw everything. There are more interactive simulators, where you can land an orbiter, aka shuttle, or use the robotic arm. They have the Airstream Astrovan on display that carried the astronauts to the launch pad. I’ve always thought the Astrovan was pretty cool. There are lots of things to see and do at the new Atlantis exhibit. We had a great time! Oh, and don’t worry since you need to exit through the gift shop, you will be able to pick up a memento, or two, of your visit with Atlantis. So grab your favorite Atlantis T-shirt and come see Atlantis in her new home!